Bring Equipment to Play It Again Sports ... Donate Credit to Connecting Kids! 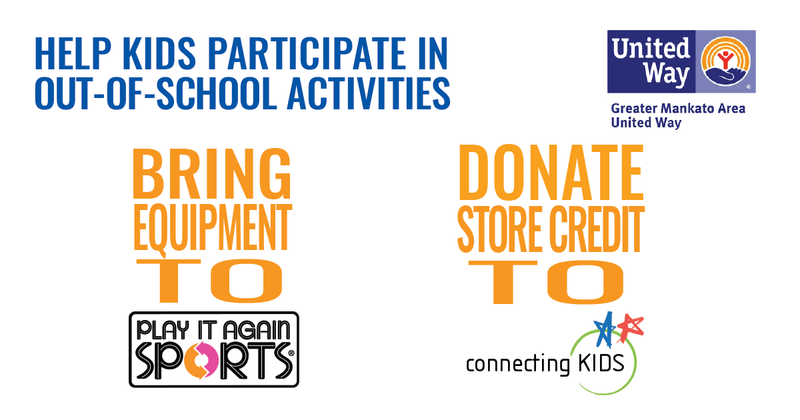 Bring your new and used sports equipment for any age to Play It Again Sports in Mankato (1668 Madison Ave). Tell the store staff you would like the credit to go to Connecting Kids. Instead of paying you, the store will put the credit towards the Connecting Kids program. Connecting Kids is a Greater Mankato Area United Way-funded program that provides activity scholarships so K-12 youth can participate in a variety of out-of-school activities, from music to sports. Last year, the program served more than 1,100 youth in our region. Contact Elizabeth Harstad at elizabethh@mankatounitedway.org or 507-345-4551.